Uglyworld #890 - Just Being HimsELF (344-365), originally uploaded by www.bazpics.com. Some of you may remember that during December last year Babo was always singing songs like "Rudolf the rednose reindeer" along with lots of other christmas carols, all in an attempt to learn them all early enough to be considered as one of Santa's Elf helpers during Christmas in 2010. This past few days Babo has spent quite a lot of time on the phone to what he refers to as the "North Poles", and announced to us this morning that he was successful in his application to be an Elf this year. It means that he has to head off to the North Pole today to help Santa out with the massive load of wishlists he has from all the kids around the world, and to help get them made, packed and delivered to the correct addresses. 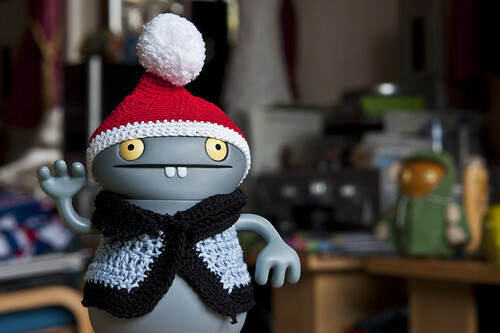 It turns out that Babo will be away right through until near the end of the year helping Santa with his work, which for some of us will be quite sad not having him around for Christmas, but he says "You has to remembers always that I is in yours heads and hearts and thats I is making Christmases perfects for all the other kids". His sidekick Wage was quite down about him going away for so long, and was also a little concerned that such a job would change Babo at least a little, but Babo told him, "I will justs be beings mysELF, don't worries". Before he left I made him pose waving to you all for todays picture while wearing his little homemade Elf's hat. To say he's a little excited about the trip would be quite an understatement! Good luck Babo and we can't wait for your return!! !